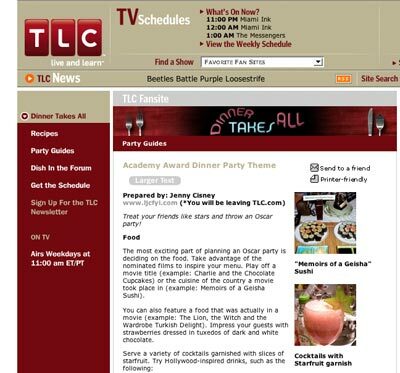 I am really excited to share a Party Theme Page I did for TLC for their Dinner Takes All party guide. My party guide is for my annual Academy Awards party. Who knew all those years of taking pictures at my parties would come in handy?! It was a lot of fun and it's so cool to see it there with the other party themes. Very cool! The folks at TLC (and we your readers too) are lucky to have you! Congratulations! WOW! So cool!! And even labeled as a "professional party planner"!!! Congrats! TLC is one of my favorite two channels these days (HGTV of course being the other one). Love, love, loved how many pictures you included! Finally they're taking notice! Great job! Congratulations! So how long till they give you your own TV show? :-) "Projects With Jenny" perhaps? Oscar is now my idol. That is so flipping phenomenal!!! Congrats congrats!!! Seriously maybe as a side job you can be a party planner!! First you meet Martha, now you're even more web famous?? Next you'll have your own show! Congrats! Way to go, girl! We're all proud of you!!! My boyfriend threw an "Iron Chef" party for me last year and Food Network liked the pictures so much they wanted us to throw another one and film it. Wow. You really are getting noticed - congratulations! I stumbled across your blog a few years ago and find myself regularly envious (particularly of your great shopping finds) as most of the shops and places you mention are nothing like those here in Australia. Keep up the great work.I love logging on to see what project will be next. Congrats. I'm with the other poster--think you might turn this into a weekend party planning job? I'm sure it wouldn't be long before people would be fighting over you to plan their party. Congrats! The party looks like lots of fun. You have so many good ideas, and I bet it's nice to get noticed. Keep up the good work, and we'll keep checking in and being entertained and inspired by you. I think it would be fun to be a party planner... but if I did that, would I have time for my own parties? Not sure. that is so cool! congratulations. you've got cool ideas, they should be shared on TLC. awesome. Very cool! Congrats on the recognition. Anyway, Gizmo and Gadget were just "tagged" -- and We're tagging Oscar! It's a blogging game where you list weird things about your dog. Go to Urban Pug to see the rules as they were passed on to us! Wow! How long did it take you to make those tuxedo strawberries??!!!!!! Aaron actually made those strawberries!